Bardin Goreksson introduced himself to the world as an unstoppable avalanche on the battlefield, an ale-swigging hurricane at the inn, and a steadfast friend by the campfire. A bulwark of comradeliness and good cheer, Bardin became the glue binding our unlikely band of heroes. Driven by his search for the lost dwarfen hold of Karak Zorn, Bardin has been somewhat side-tracked by the ceaseless Skaven interference. Yet he stays true to his spirit, fighting the good fight as a hero whose deeds do his ancestors proud! Rangers forsake the dark comfort of hearth and hold, roaming far and wide to vanquish foes far from the walls of their homes. They seldom receive proper appreciation from their dwarfen brethren and are all too often viewed as eccentric, or even wits-addled. Nonetheless, they are vital to a hold’s ongoing defence, hardened as they are by the harsh environments of the surface world, and accomplished in the arts of tracking and ambush. Bardin’s experiences in Ubersreik have honed his skills to that of a Ranger Veteran. Steady of hand and keen of eye, he adapts swiftly to the horrors vomited forth from the shadows and battles implacably until they breathe no more. The search for Karak Zorn still weighs heavy upon Bardin, but the Reikland’s perils compel him to attend to more urgent matters. In battle, Bardin the Ranger favours a head-on approach, using his arsenal of ranged weapons to punish the foe from afar. Yet he is no stranger to the press of melee. 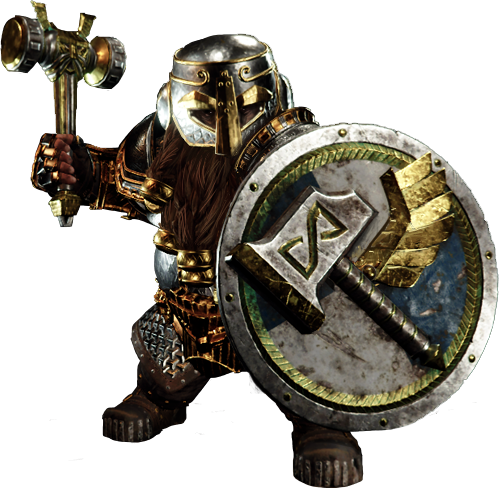 Should the need arise, dwarfen steel will punish those enemies foolish enough to stray within Bardin’s reach. Maybe not with the same flourish as Cousin Okri, but near enough to count. Ironbreakers are the stalwart protectors of the dwarfen holds, considered by many to be the elite of their kind. Clad in magnificent runic armour and brandishing weapons of incomparable make, they muster in the deepest, darkest tunnels, prosecuting an endless battle against Skaven and worse. Before he embraced a Ranger’s duties, Bardin earned his beard as an Ironbreaker in the great hold of Kazak Norn. Skills burnished in darkness did not lose their lustre in the light. Following the defence of Ubersreik, Bardin felt the Ironbreaker’s oaths and gromril armour calling him once again, for only an Ironbreaker could stand as a bulwark against the evils gathering against the surface world. As an Ironbreaker, Bardin is the indomitable bastion upon which the Vermintide breaks apart, a rallying point for straggling allies and a grim promise of death to rampaging foes. Be they ratman or Rotblood, no foe shall easily overcome the Ironbreaker, not while he has breath in his body and dwarf-forged gromril in his hand. Slayers can be counted amongst both the deadliest and most tragic of warriors. The embodiment of implacable, calculating destruction, they plunge into the most desperate of battles, thirsting to expunge past failure or personal tragedy in a blaze of glory. Yet there is nothing rash or reckless in the Slayer’s quest. The only thing that matters more to such a dwarf than a grand death, is postponing that demise long enough to see another foe brought to bloody account. Unbeknownst to his comrades, Bardin has long borne a burden on his heart. In the carnage at Ubersreik, that burden blossomed into a new and terrible ambition. Thus Bardin cast aside the Ranger’s garb in favour of the Slayer’s spiked hair and tattooed shame. Now, an honourable death is the only thing to satisfy him, though such is his formidable battle-skill that death may yet be a long way distant. The Slayer Oath prohibits Bardin from using ranged weaponry, but his capacity for slaughter remains undimmed. Driven by pride, determination and the appraising eye of a tempered killer, Bardin is a whirlwind of carnage, equally lethal with hand axes or the cleaving fury of a gromril great-axe. He is dwarfen vengeance personified, and the bringer of death.